Region: This bug is found in the southern United States, as far west as New Mexico and Arizona. Life cycle: This insect produces one to two generations each year and the adults overwinter in garden debris. 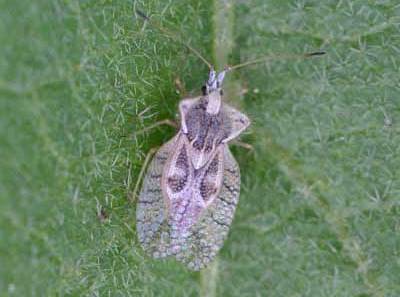 Physical Description: This 1/4 inch long lace bug is grayish to light brown, flat, and has transparent, lace-like wings. The nymphs are brown or black, spined and have no lace-like covering. The black eggs are laid in groups on the underside of leaves. Feeding characteristics: This pest attacks eggplant, potato and tomato plants by feeding in groups on the undersides of leaves covering them with brown spots of excrement. The leaves become curled and turn pale. Damage is usually minimal, but left untended could cause the plant to die. Controls: If you see the symptoms or the lace bug itself, run the leave between your fingers to kill any Bugs present. Do this as early in the season to prevent destructive infestations from building up.